Rugged, ancient and stunningly beautiful, the Red Centre of Australia is a must-see. From the epic monument that is Uluru to the history of Alice Springs, not to mention the joy involved in taking one of the world’s great rail journeys on the legendary Ghan. Spend time in the gorgeous Northern Territory and you’ll never want to leave. From sunrise to sunset, Uluru is a kaleidoscope of colour and movement. Take a cultural tour, venture further afield to the marvels of Kata Tjuta and Walpa Gorge, and be awed by the once-in-a-lifetime ‘Field of Light’ art installation, lighting up the desert night. Visit the iconic Royal Flying Doctor Service and the School of the Air, both monumentally important in connecting outback Australia to the outside world. The luxurious cabins, fine dining and incredible panoramas that greet you on The Ghan will truly delight as you make your way to sultry and welcoming Darwin on the journey of a lifetime. Enjoy breakfast on board as you gaze out of the window taking inspiration from the ever-changing landscape.Upon arrival in Katherine, choose between a guided cruise through Katherine Gorge, where you will marvel at the towering red ochre sandstone walls and hear stories of the Jawoyn people or enjoy The Ghan’s cultural experience that will take you to the heart of this area. Create your own indigenous painting, learn to throw a spear and hear ancient Dreamtime tales. 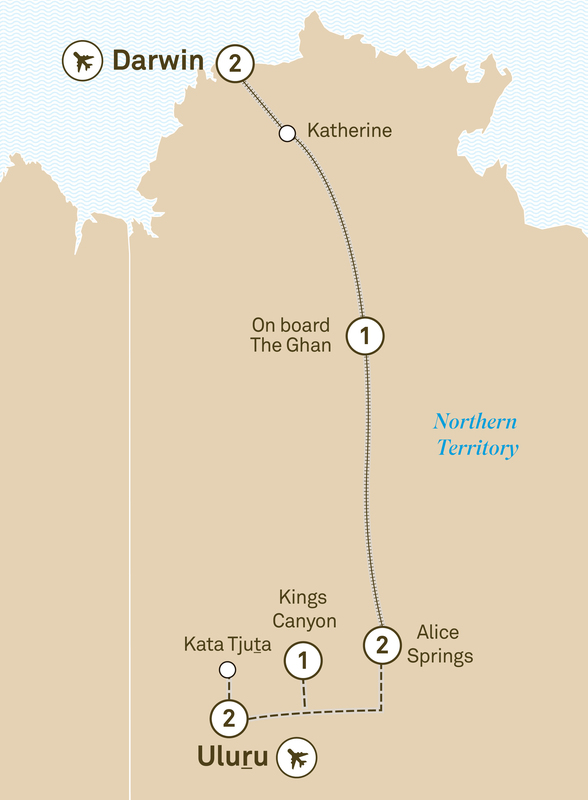 Reboard the train and travel to Darwin for your two night stay. Say goodbye to your new friends, before returning home with many great memories.